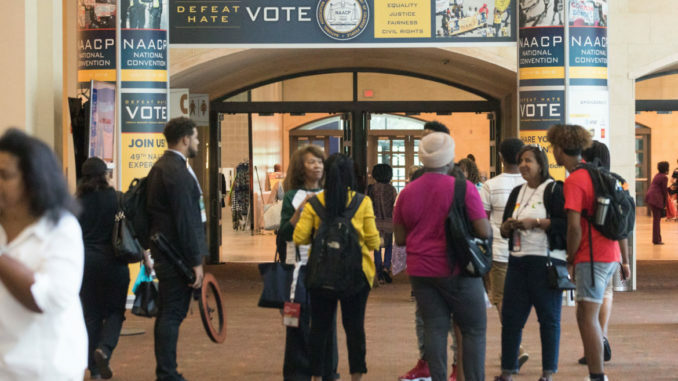 Panelists and civil rights leaders encouraged people of color and millennials, in particular, to Stop Hate and Vote, during the 109th NAACP annual convention. NAACP national convention attendees socialize outside of the entrance to the NAACP Experience exhibition hall. Thousands of people from across the country gathered in San Antonio, Texas for the 109th Annual NAACP Convention. The convention also included a diverse career fair, educational seminars, workshops on public policy, and a special hip-hop summit. Johnson also spoke about the importance of millennials and their community and political engagement. Championing this effort, NAACP Chairman Leon W. Russell shared his own ideas during his annual convention address. Acknowledging that nearly 63 million Americans voted for the current president and that Black voter turnout declined, Russell still expressed hope for the future. “Our hope is to vote out the hate and we need everyone to vote,” Russell said. The NAACP also honored Willie Brown, San Francisco’s first Black mayor, with the “Spingarn Medal,” the organization’s most prestigious award; the award was in recognition of his years of civil rights work and dedication to the betterment of the Black community. Former President Bill Clinton presented the award to Brown and paid tribute to the civil rights activist. Brown said that the Spingarn Medal represented his dedication to public service and the community. Dozens of millennials attended this year’s convention, much to the pleasure of former NAACP President and current National Newspaper Publishers Association President Dr. Benjamin F. Chavis, Jr.